Go here for a slideshow of exhibit images. Go here for an audio and visual tour of the exhibit. he catalog foreword for Power and Pathos: Bronze Sculpture of the Hellenistic World, an exhibit at the National Gallery of Art in Washington that closes March 20, declares, “At its best, Hellenistic sculpture leaves nothing to be desired or improved upon.” While this might be true, the approximately 50 works in this exhibition, few of which qualify as Hellenistic sculpture “at its best,” do little to support the case. It’s not hard to think of bronze masterpieces that weren’t included. Such masterpieces, however, are extremely rare. Of the many thousands of bronzes produced during the Hellenistic era—the 300-year interval between Alexander the Great and Augustus—only a tiny fraction survived the destructive forces of Christian zeal and the need for cheap, readily accessible metal during the Middle Ages. 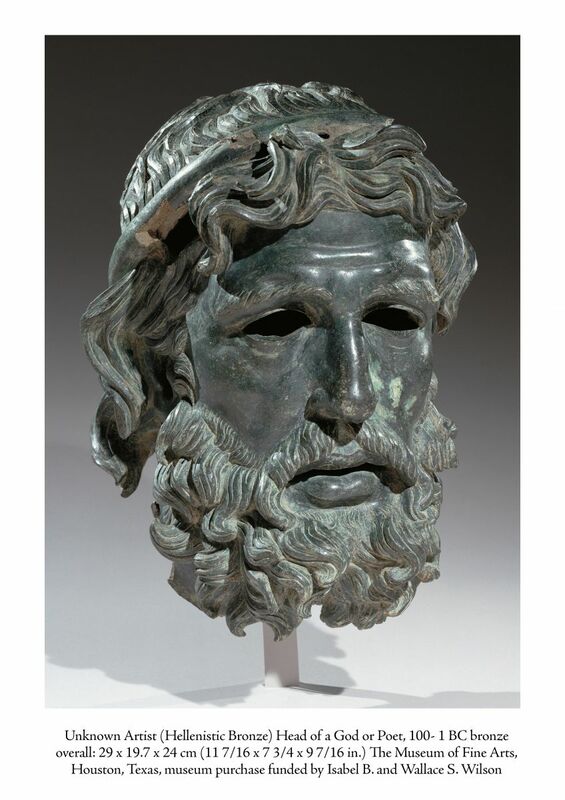 Power and Pathos shows that the bronzes still extant vary greatly, in terms of both artistic quality and physical condition. Nonetheless, the exhibition teaches us about different levels of sculptural production during the Hellenistic period. Marble works—the stupendous Pergamon altar reliefs in Berlin, the Winged Victory of Samothrace and Venus de Milo in the Louvre, as well as high-quality Roman marble copies of Hellenistic bronzes—mainly define our understanding of Hellenistic sculpture. An excellent example is the Dying Gaul exhibited at the National Gallery two years ago (see “Natural Right and Art History” in CRB’s Summer 2014 issue). Bronze, the focus of Power and Pathos, was the medium of choice for the honorific statuary that portrayed generals, statesmen, other public benefactors, athletes, poets, and philosophers. Bronze statuary comprised a major genre of Hellenistic art, proliferating in the agoras and council houses. Statues in the timeless precincts of temples and cemeteries were more likely to be carved in marble. 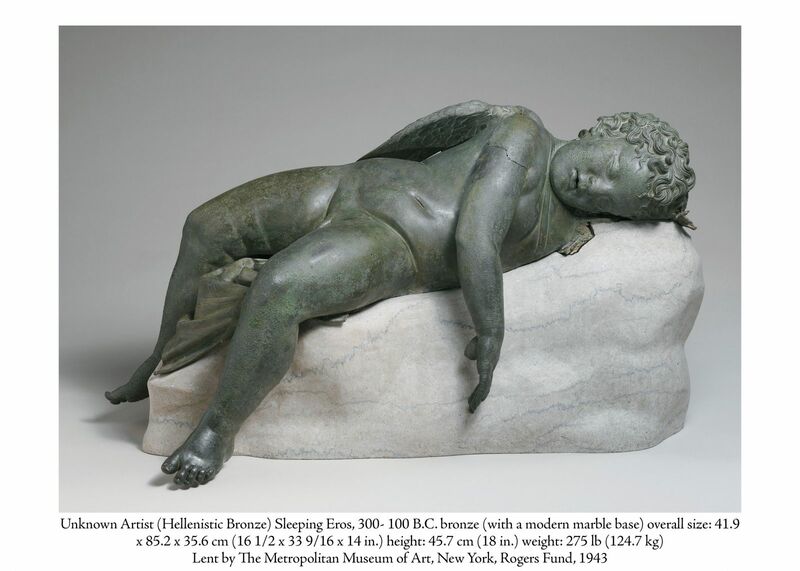 One of the best preserved works in Power and Pathos is the Metropolitan Museum’s life-size Eros (or Cupid), sound asleep on a rock. Cupid is depicted as a baby, equipped with wings and a quiver, the latter of which is missing along with the left arm on which he reposes, his chest and head rotated 90 degrees in relation to the outspread legs, which dangle from the rock. His limp right hand hangs in front, presumably having let go of the bow. The anatomical displacements generated by the pose include the distended belly and the emphatically asymmetrical treatment of the two sides of the back flanking the spine, the channel leading the eye in an upward diagonal from his buttock, over his shoulder and past the neck. From feet to forehead, the baby’s rotund topography, rigorously modeled to express its interior anatomical structure, guides the eye along and around the figure while reinforcing its formal unity. His swirling curls of hair contribute to that unity. The belly is contracted and the lips parted, so the baby is exhaling, but the sculpture suggests anything but the recording of an instantaneous pose. The baby looks like it could sleep on forever, and the impression is only reinforced by its vivid spatial presence. Such topographical coherence emerged in the Classical sculpture of the fifth century B.C. but was taken to new heights in Hellenistic work. Two heads of great formal complexity—one mostly likely belonging to a portrait statue of a statesman, the other to a statue of a god or perhaps an apotheosized poet—beautifully illustrate this principle, as well as the expressive range of the sculpture of the period. Discovered on the island of Delos a century ago, the portrait head is dated to about 100 B.C. A realistic portrait of a short-haired, beardless man in his early middle age with weighty matters on his mind, his head is turned slightly to his left. As with the Eros Sleeping, the shapes of the head have been orchestrated into a resounding unity that transcends natural appearances. Nothing we see detracts from that unity. One form flows harmoniously into the next, while each is modeled with great geometric precision. So while the portrait’s realism seems in contrast to the more abstract or “idealized” character of Classical sculpture, it is actually operating on the same topographical principle. Without its complexity, which is not mere artifice but rather derived from the model, the sculpture’s topography would be comparatively lifeless. Important as style is in addressing the imagination and reflecting cultural norms of appropriateness, content is more important. That is the great lesson Greek sculpture teaches us. Unlike the Delos head, that of the older, thick-bearded and long-haired god or apotheosized figure from Houston’s Museum of Fine Arts is more stylized and abstract, and our sense of abstraction is heightened by the absence of the original inset eyes. The subject’s countenance is less amply proportioned than the statesman’s. Yet the same formal qualities predominate, with the rotundity of the prominent lower lip reiterated in the nostrils, prominent cheekbones, and fleshy brows and forehead creases. Any notion of generic or formulaic modeling is readily dispelled by the nose’s supple profile, especially at the bridge, and by the subtly distinctive treatment of the bag under each eye. Here again, the forms are orchestrated to create a unified whole to which all parts are subordinated and from which no part detracts. The figure’s countenance is beautifully framed by the beard and hair-locks, the latter parted at the middle beneath the fillet circling his head. The idea of divinity, of preternatural animation, is intensified by the sense of movement the hair and beard convey. Other portrait heads in the exhibition fall short either of the degree of formal complexity or the level of formal resolution we encounter in these two bronze heads. In the case of the head of a statesman believed to be Piso Pontifex (48 B.C.-32 A.D.), the sculptor tailored Hellenistic technique to Roman demands for characterization distinctly suggestive of authority and austerity. But the somewhat rigid features that result—the very conspicuous concavity in Piso’s left cheek is a matter apart, and the catalog should have told us whether it resulted from damage—involve realistic rendering of form as opposed to the more demanding, Classically-grounded orchestration of form. Perhaps this is where the dissolution of the Classical-Hellenistic tradition over the course of the Roman Empire began. 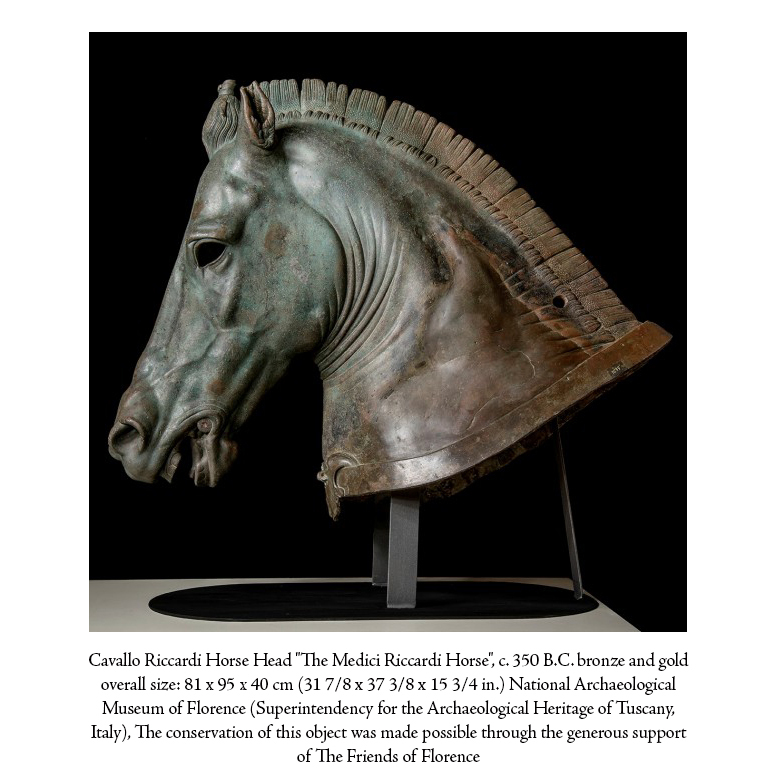 Also very fine is the Medici Riccardi Horse, a life-size bronze head that is all that remains of an equestrian statue. Rich in anatomical content, the modeling of this head also retains some of the stylization of the horses that figure so prominently in the Parthenon’s sculptural decoration. But the Medici horse is more obviously akin to the more realistically modeled heads of the magnificent four horses of St. Mark’s in Venice, which were once harnessed to a chariot. The Medici and St. Mark’s horses conform to a common type readily identifiable in such features as mane forelocks bound by ribbons and ears turned in different directions—the latter a realistic detail, as Prof. Carol C. Mattusch of George Mason University notes. The head of Marcus Aurelius’s mount in the famous Roman equestrian statue conforms to this type. The life-size statues on view at the National Gallery are generally disappointing. (For the record, the celebrated Terme Boxer from Rome, which came to the Getty Museum in Los Angeles last year with the Power and Pathos exhibition, did not travel to Washington.) The Apoxyomenos from Vienna, a round-cheeked athlete wiping the grit from a strigil with which he’s just scraped his oiled body after a contest, and the Getty Bronze, a slender victor crowning himself with a wreath, feature contrasting musculatures—the former’s more Classical in its delineation of forms such as the pectoral muscles while the latter’s is “softer” and impressively supple in its modeling. Neither measures up to the Vatican Apoxyomenos, a Roman marble copy of a lost Hellenistic bronze that is more dimensional in design, dynamic in pose and elegant in its proportions. The Getty Bronze is particularly flawed. Viewed from his left, the victor’s head (which turns to his left) reads as being too small for the neck, while the very deep bridge of the nose makes for an awkward recession of the left eye. The slanted mouth, moreover, reads as forming something of a sneer that resolves poorly with the frontal view. The champion’s fingers are elongated—a baroque technique often employed in Hellenistic sculpture—but they are out of scale with the head. In the frontal view, the serpentine forefingers of the raised right hand (which clasped a lost wreath) are distracting. 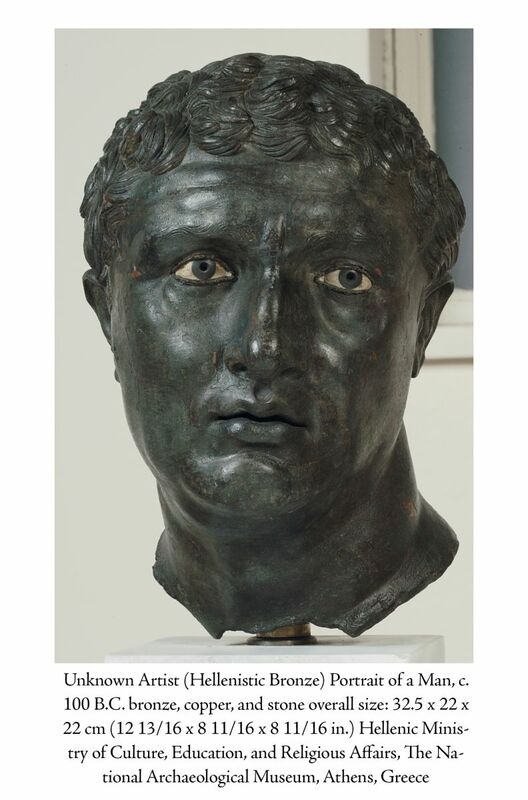 Brad Parker, an uncommonly gifted Baltimore sculptor who has studied Hellenistic sculpture for many years, suspects the Getty Bronze is a hybrid: a low-quality Roman head plopped on a high-quality Hellenistic body. Such confections were by no means unusual. The finest statue in the exhibition was recovered in two fragments off the Adriatic coast in 1992. At first glance, it is a mess: seriously discolored, with a good deal of the head’s modeling worn away, and the legs and one arm missing. Parker directed my attention to the exceptionally fine modeling of the naked torso, whose topography is not defined by delineated forms (as with the Vienna Apoxyomenos) but by a supple modulation of shapes that nevertheless define an “athletic” or “heroic” musculature—one of a middle-aged man as opposed to a champion in the prime of life. The statue might have portrayed a Roman general. A somewhat diminutive statue of Athena discovered in 1541 at Arezzo, not far southeast of Florence, is notable for the exquisite design of its vesture, the generic treatment of the countenance and a rather unimposing presence. It is no match for the Hellenistic bronze Athena in the archeological museum in Piraeus, Greece. 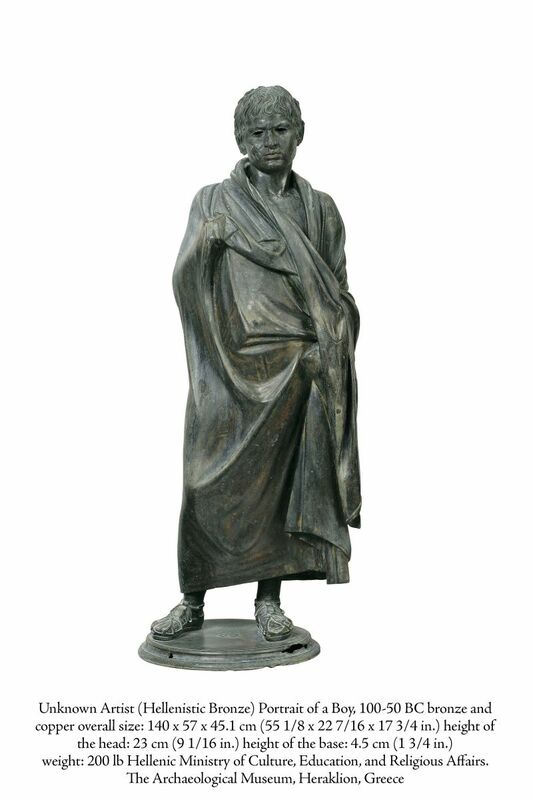 A portrait statue of a boy draped in a heavy cloak or himation attracts one’s attention largely because of his intriguingly forlorn facial expression. This could be a victor’s statue, or a statue commissioned by the boy’s family for a domestic courtyard, or a funerary work. But it is mostly devoid of the refinement of high-quality Hellenistic statuary. The face of the boy, who was found on Crete, is rather cursorily modeled and betrays precious little glyptic rigor, even if his tousled hair is artfully handled. The boy’s thick, almost rubbery himation likewise reveals little of the anatomical structure underneath, and viewed from his right flank, the sharply bent right arm beneath the himation seems under-scaled. 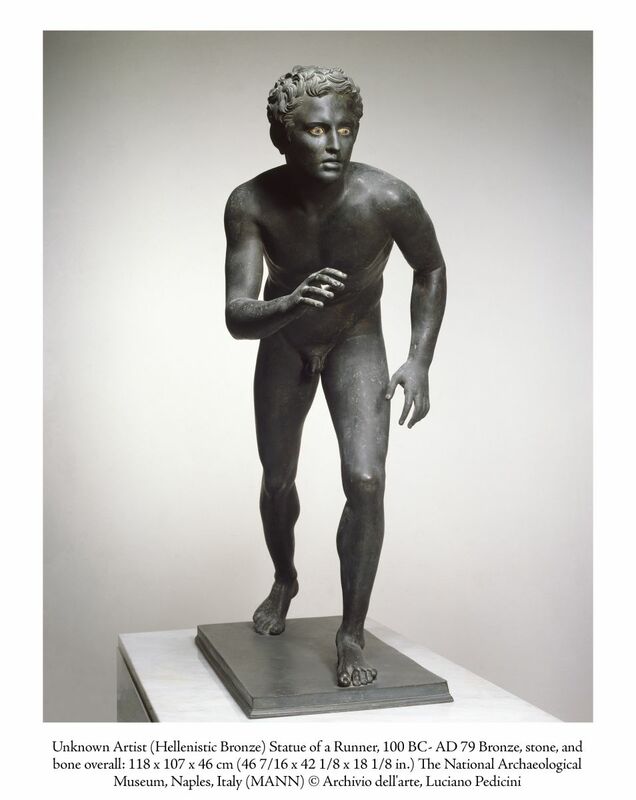 A life-size Boy Runner—discovered in 1754 during the excavation of Herculaneum, near Pompeii—suggests that his Roman owner was more interested in an eye-catching showpiece for his spacious colonnaded garden than a fulsome exhibition of sculptural art. The boy leans forward in a dynamic pose just before the start of a race. The modeling of this undeniably appealing figure, which retains its inset bone-and-stone eyes and was paired with another surviving bronze probably derived from it, is generic and superficial, starting with the face and back. Much less impressive, however, is the youth known as the Idolino, discovered nearly 500 years ago in the Adriatic town of Pesaro and promptly installed on a high, ornate Renaissance base. The Idolino boasts a handsome head derived from the Classical master Polykleitos. Pronounced a beautiful Greek work by art history’s erratic founder, Johann Joachim Winckelmann (1717-1768), the Idolino is in fact endowed with an almost crudely formulaic body. The result is a Polykleitan pastiche, and the Idolino in fact served not as a monument but as a decorative lamp-holder. Life-size statues of two Roman political figures strike a noteworthy contrast. One is a provincial orator, his over-scaled right hand raised in a call for silence, who is elaborately garbed in Roman sandals and a toga with an Etruscan inscription on the hem. The rigid posture, bloated right shoulder and overlong arm extending from it and the sunken chest betray a provincial artistic ineptitude. 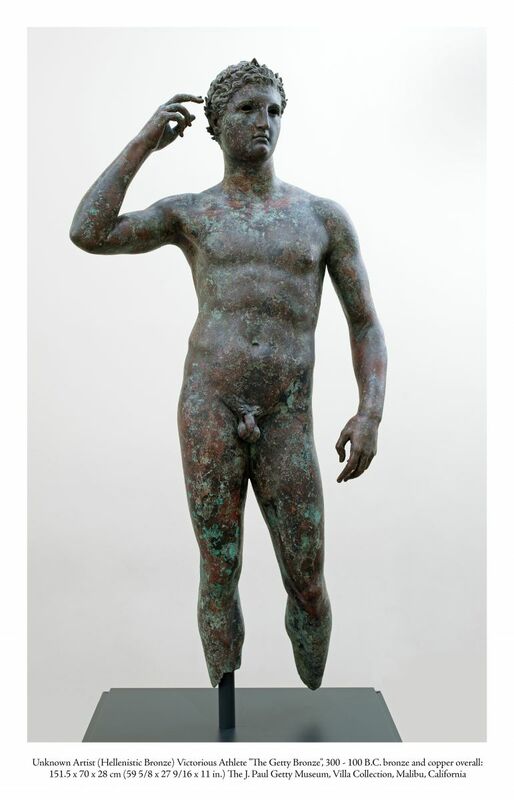 More indicative of mainstream Hellenistic work is a dignified statue of an aristocratic young Roman, almost certainly a member of Augustus’s family, said to have been found on the island of Rhodes, an important center of sculptural production. Reduced-scale sculptures in the exhibition provide an idea of the range of Hellenistic genres, and are typically miniature versions, produced for Roman patrons, of what would have been well-known over-life-size works. These sculptures are almost certainly not of the quality of their prototypes. Even so, a reduced-scale equestrian bronze of Alexander, shown mounted on his horse and turned as if to face an adversary with his now swordless right hand raised aloft, includes a handsomely outfitted horse that is very fine. A statuette of a naked ruler belongs to the same genre as the titanic Terme Ruler in Rome. A hyper-muscled Hercules reposing on his club after his labors and a standing Hermes give us a sense of the new body styles that emerged with the Hellenistic baroque. (There are no female nudes in the exhibition, however.) More spectacular is an exuberant dancing Pan, striding forward on his toes, his bent arms raised so that the biceps form a diagonal and the forearms are parallel. Pan’s arms and torso rotate on his trunk; his horned, faun-eared, thickly-maned and bearded and acorn-bedecked head is aligned with his forward stride, with the god’s malicious countenance raised upward in ecstatic augury of orgiastic pursuits hither and yon. He provides a sense of the dynamic compositional techniques that emerged in the Hellenistic era. So does the Artemis with Deer, in which the three-foot-tall figure of the hunter-goddess reacts to the sight of prey in the distance with balletic grace as a statically and naively posed deer gazes up at her. Power and Pathos, then, is more successful in providing an engaging cross-section of the sculpture of the Hellenistic period than conveying the depth of the Hellenistic achievement. It is interesting to see a couple of decorative sculptures from Yemen, each an Eros riding a lion, each produced with an indigenous casting technique, each inscribed in Qatabanic script. These sculptures are Hellenistic in terms of theme and style, not sophisticated formal content. But it is style, as the late painter and critic Pierce Rice observed, that lends coherence to the artistic fabric of a culture. 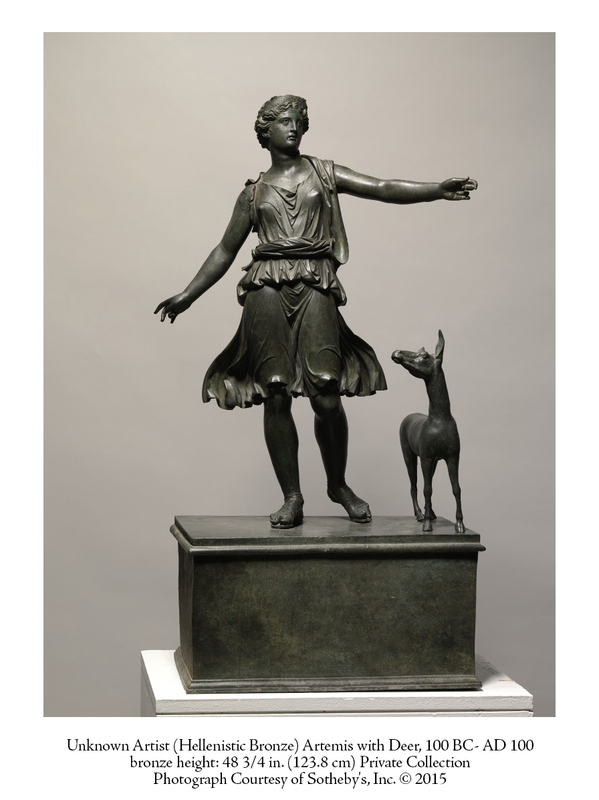 Most of the bronzes in Power and Pathos show lesser sculptors adapting new styles, techniques, and themes to their own productions as best they could. Before coming to the Getty, Power and Pathos was mounted at the Strozzi Palace in Florence. 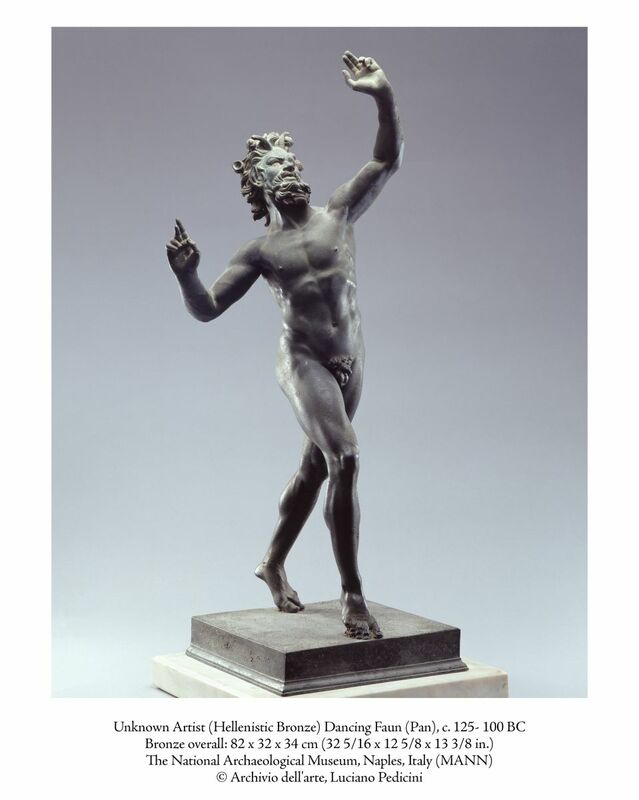 A dozen works that appeared at those two venues are not on view in Washington, while the Boy Runner, Dancing Pan and Artemis with Deer are exclusive to the National Gallery exhibit.